Our latest open online course ‘Introduction to Dyslexia and Inclusive Practice’ is now live. 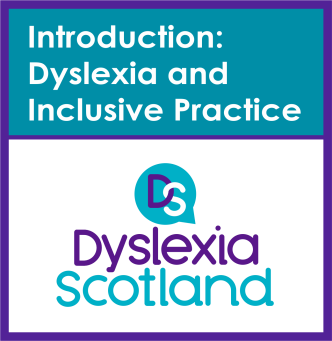 The course has been developed by the Dyslexia Toolkit Working Group, led by Frances Ranaldi of Education Scotland, and developed in partnership with the Opening Educational Practices in Scotland project. ‘Dyslexia and inclusive practice’ is the first of three linked courses supporting the Addressing Dyslexia Toolkit. The toolkit and the courses will increase support for educators to deliver inclusive education across Scotland. The course is aimed at teachers, community educators and anyone with an interest in inclusive practice and supports the recommendations of the 2014 Education Scotland Review: ‘Making Sense: Education for Children and Young People with Dyslexia in Scotland’. It also links to the General Teaching Council of Scotland’s professional standards. We are delighted to launch the course during Open Education Week as it is an excellent opportunity to celebrate the impact of open education on teaching and learning. This course is an example of how free and openly licensed courses are a cost-effective and easily accessible means of disseminating nationwide training on key issues in education. From South Lanarkshire to Shetland, West Lothian to the Western Isles educators will be able to access this course at a time, pace and place that suits them. This substantially increases the opportunities for educators to develop their inclusive practice in education. As with all our courses if you use, reuse, remix, revise or redistribute it then please let us know as we’d love to know how it’s being used. For further information about dyslexia see the Dyslexia Scotland website. Posted on March 28, 2017, in Announcement, free course and tagged #openeducationwk, Addressing Dyslexia Toolkit, Dyslexia, Dyslexia Scotland, free course, inclusive practice, OEP, OER. Bookmark the permalink. Leave a comment.